Business Card Maker Software includes an easy platform to create the business cards that can meet any type of business needs and requirements. Software uses wide range of image or card designing objects like Pencil, Text, Color, barcode, Pictures, Line, and Ellipse etc to create business cards. Software is having Batch Processing Series option to create multiple Business cards at the same time. 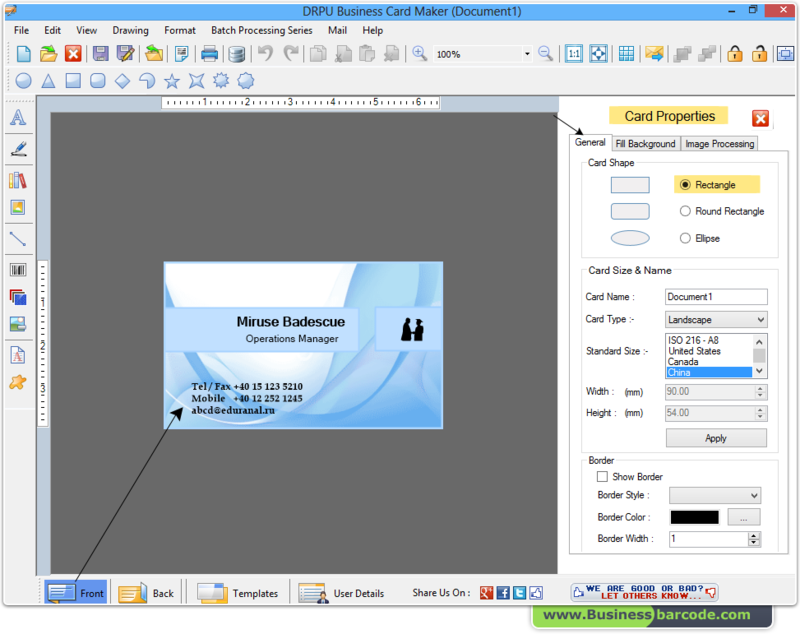 Using this software you can also print your designed business cards. In above screen, you can see designed business card’s front view. Provides option to save your business cards in different file formats including JPEG, PNG, BMP, etc. with image designing objects including Line, Ellipse, Pencil, Rectangle, Text, Barcode, Picture, Arc, Triangle and Star objects. Option to print business cards inbuilt advance print settings to print designed business cards..